This progress is the result of a collective effort from partners across the GTHA who have been instrumental in implementing The Big Move, including municipalities, transit agencies and provincial ministries. Putting the ten strategies in motion. In addition to moving forward with major rapid transit investments, Metrolinx and its many partners have also been implementing many projects that reflect the full breadth of the ten strategies in The Big Move. Together, these initiatives are having a positive impact on mobility in the region. The Big Move Baseline Monitoring Report (2013) provides a comprehensive review of progress on all of the actions and policies in The Big Move. Municipalities and Metrolinx expanded the Smart Commute workplace program to provide TDM programming for approximately 330 members (with 720,000 employees), and launched many initiatives to support active school travel. 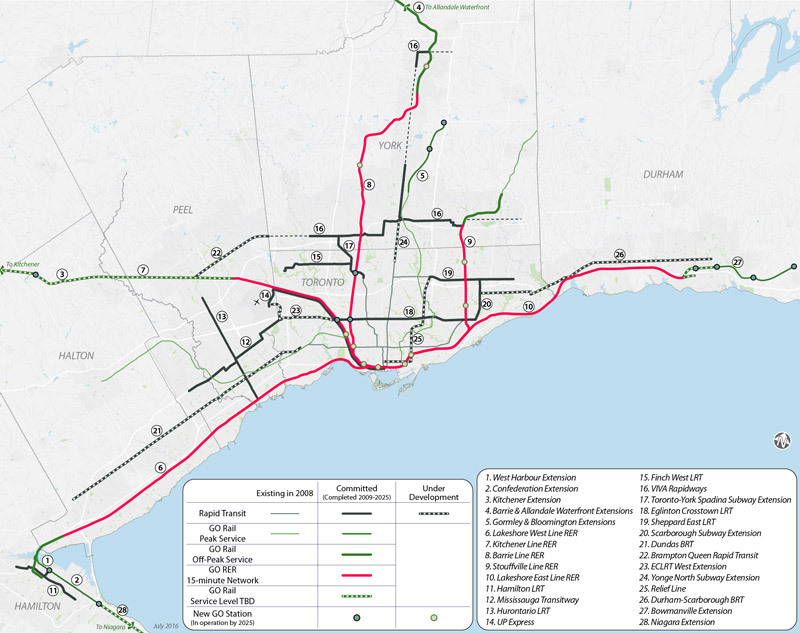 Figure 3 presents a map of rapid transit in 2008, and Figure 4 presents a map of funded GTHA rapid transit projects expected to be completed by 2025, as well as “Next Wave” projects that are being advanced through further planning and design. A Huge Step Forward: GO Regional Express Rail (RER). The impact of the RTP was clear in 2015 when the Province of Ontario announced its commitment to faster, more frequent, electric GO rail service across the whole region. This initiative will transform the GO rail network from a largely rush-hour service into an all-day, two-way rapid transit network, increasing transit ridership, reducing trip times and helping to manage congestion. The GO RER concept was set out in The Big Move and its implementation continues through the province’s Moving Ontario Forward plan. Today, GO RER is creating new opportunities across the region by improving convenience, unlocking development potential, and making employment centres more accessible with 15-minute frequent train services. Rush-hour GO rail services will also be expanded to ease connections to other transit systems and reduce customers’ reliance on schedules. GO RER will provide four times the number of trips in off-peak periods, such as evenings and weekends, and twice the number of trips during peak rush-hour periods. Upgrading most of the GO rail system from diesel to electric engines in core areas of the network will enable faster travel speeds, more frequent service, and reduced operating costs and emissions. Every area of the GTHA will see improvements with GO RER. GO ridership is expected to almost double - an increase to approximately 127 million customers - within five years of completion. “First Wave” projects. Implementing The Big Move began in earnest with the commitment of significant funding to a “First Wave” of transit projects drawn from the Plan’s list of Top Priorities. While several projects have been completed, many others are currently in planning or construction phases. York Region VivaNext rapidways (first major segment opened 2013). This project includes more than 34 km of dedicated express bus lanes on major roads including Highway 7, Yonge Street and Davis Drive. Mississauga Transitway (first segment opened 2014). This 18 km corridor that parallels Highway 403 and Eglinton Avenue will allow buses to run unhindered by general traffic when fully completed, connecting the TTC subway system, Mississauga City Centre and employment hubs such as the Airport Corporate Centre. UP Express (Opened 2015). This direct rail link between Toronto Pearson International Airport and Union Station offers 15-minute frequency with stops at Weston and Bloor GO stations. GO Transit rail service expansion (ongoing). Multiple projects to enhance regional rail service as identified in The Big Move have been completed since 2008, including the introduction of hourly bidirectional mid-day service on the Kitchener line between Union and Mount Pleasant and the extension of the Lakeshore West line to the new West Harbour station in Hamilton. The extension of the Richmond Hill line to the new Gormley station will open in late 2016. This GO expansion has been supported by upgrades to Canada’s busiest transportation hub, Union Station, as prioritized in 2008 as “Big Move #3”. Completed and ongoing work includes revitalization of the train shed and switches as well as expanded concourses, new PATH connections, and a second subway platform intended to accommodate more passengers. Toronto-York Spadina Subway Extension (Planned opening late 2017). This extension from Downsview Station to Vaughan Metropolitan Centre will be the first subway line to extend outside of the City of Toronto. Eglinton Crosstown LRT (Planned opening 2021). This 19-km route, with more than 10 km underground, will carry riders across Toronto from Weston Road to Kennedy subway station. Finch West LRT (Planned opening 2021). This 11-km line will run from the Finch West subway station now under construction at Keele Street to Humber College. Sheppard East LRT (dates to be determined). This line will run almost 13 km from Don Mills subway station to east of Morningside Avenue. Scarborough Rapid Transit (dates to be determined). The funding for the Scarborough Rapid Transit project identified in The Big Move in 2008 has been reallocated to a replacement project led by the City of Toronto, to extend the Bloor Danforth subway. The Scarborough subway extension is currently in the planning phase. With funding now in place for many of these projects, work is now underway, with the intent of growing the GTHA’s rapid transit network and extending all-day regional transit service. GO Regional Express Rail (Phased implementation 2014-2024). The GO RER program is a $13.5B capital investment to transform the GO network from a commuter-oriented service to a comprehensive regional rapid transit option. Service levels on all seven GO rail lines will be increased and electric service, every 15 minutes or better in both directions throughout the day, will be introduced in core areas of five lines: Lakeshore East, Lakeshore West, Kitchener, Barrie and Stouffville. UP Express Electrification will also be achieved through the GO RER program. Hurontario LRT (Planned opening 2022). This 20-km service between Port Credit and the Brampton Gateway terminal at Steeles Avenue will link four mobility hubs and support planned urban growth areas. It will connect to the Mississauga Transitway and planned Dundas Street BRT as well as the Milton and Lakeshore West GO lines. Hamilton LRT (Planned opening 2024). This project will run across the lower portions of the City of Hamilton, connecting McMaster University to Queenston Circle through the city’s downtown core. It will connect to West Harbour GO station as well as future pedestrian link to Hamilton GO Centre. Relief Line. This new rapid transit line would provide new access options to the GTHA’s largest employment area, downtown Toronto, and relieve Yonge subway line congestion. Yonge North Subway Extension. This proposed extension from Finch Station in Toronto to Highway 7 in Richmond Hill would be the second subway extension reaching beyond the City of Toronto, connecting to Viva BRT lines running to the north, west and east, as well as the Richmond Hill GO line. Dundas Street BRT. This 40-km east-west transit project would cross the western GTHA, connecting Brant Street in the City of Burlington to Kipling subway station in Toronto. It would connect the Milton GO line, the Bloor-Danforth subway and the Hurontario LRT. Durham-Scarborough BRT. This new line would run from the Scarborough Civic Centre in Toronto to downtown Oshawa in Durham Region via Highway 2, connecting the downtown cores of Pickering, Ajax, Whitby and Oshawa to one another and offering Durham residents improved access to the TTC rapid transit network. Next Wave rapid transit projects enable more people to reach jobs and meet other daily needs using transit. If fully implemented, these projects would bring 72% of residents and 76% of jobs within two kilometres of rapid transit, compared to 42% and 64% (respectively) in 2001. The potential implementation of all Next Wave rapid transit projects could create up to 900,000 person-years of employment and contribute up to $130 billion to Ontario’s economy. Which changes over the past decade have been most important to you? How have they affected you?